From time to time, The Library must take out of service a piece of equipment or furnishing donated in the past because the item is no longer functional. While the piece itself can’t be retained, we don’t want to lose the memory of these special gifts. We are keeping that memory alive with this virtual memory wall, and we thank all library supporters, past and present, for their kindness, vision and support. The following three plaques were removed from the McCormick Riverfront Library (formerly the Harrisburg Downtown Branch/Harrisburg Public Library) as a result of the renovation/restoration completed in 2009. The Library thanks the Junior League, Mr. & Mrs. John Kunkel, and the Harrisburg Jaycettes for gifts that stood the test of time. The plaque reads: "The lights for these shelves are the gift of The Junior League of Harrisburg, 1955"
The plaque reads: "The flags presented by Harrisburg Jaycettes, 1964"
This plaque was removed in 2012 from a bench outside the East Shore Area Library, where it served staff and public well for 30 years. The bench had to be removed due to deterioration, but the memory of Dr. Azizkhan lives on. 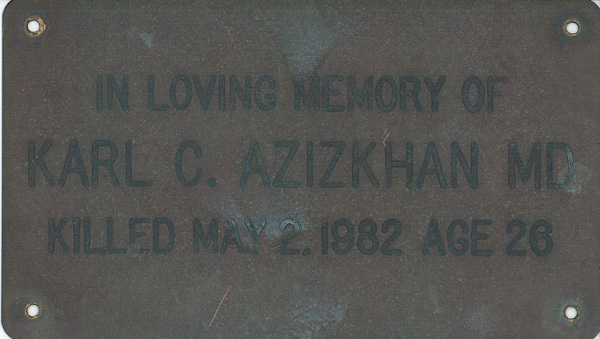 The plaque reads: "In loving memory of Karl C. Azizkhan MD, Killed May 2, 1982, Age 26"